A couple years ago, I declared the JBL Everest Elite 700 the best alternative to the pricier, trickier Beats. They sound great, cost less, and even look a heck of a lot like the Beats Studio Wireless. Now, JBL has released a new model that offers even more—the Everest Elite 750NC—and boy are they excellent. A wireless Beats competitor with bigger bass. Terrific noise cancelling you can adjust through an app. Weak on mid- and high-range notes. The most noticeable difference between the $250 Everest Elite 700 and the new $300 Everest Elite 750NC is the design. While the new model shares similar contours with the older version, the 750NC is undeniably sleeker and lighter. The tilted, swiveling, oval-shaped ear cups provide a more ergonomic fit, and a plusher cushion on the top of the headband cuts down on discomfort over hours of listening. The 750NC feels very solid, like its predecessor, but you’ll forget you’re wearing them after a few minutes. You could even compare them to the nice fit of the Beats Studio Wireless, which feel like a firm but comfortable hug. With any headphones, though, comfort is only half the battle. Sound quality is what differentiates the JBL Everest Elite 750NC from its predecessors as well as the Beats. The 750NC headphones put out some big, big sound. When you listen at full volume, you can actually feel the bass on tracks like “The Grid” from the Tron: Legacy soundtrack by Daft Punk. Hearing “Stairway to Heaven” by Led Zeppelin feels like sitting in a sound studio with your eyes closed, and you’re plugged straight into the amp. “Jesus, etc.” sounds like smoking cigarettes, which I’m quite sure was Wilco’s intent when they released it 15 years ago. The module for controlling them is built right into the side of the ear cup. So these headphones can do big sound, which is fun. If you compare them to the $380 Beats Studio Wireless, the cheaper JBL Everest Elite 750NC offer more thump on bass-heavy tracks, but the precision isn’t quite there. Smaller, more delicate high end notes and texture get a little bit lost in what I’d describe as muddy mids and, naturally, a whole lotta bass. The more expensive Beats, however, sound crisper and more detailed. You pay for that fidelity, but the difference might not be worth $80 to you. 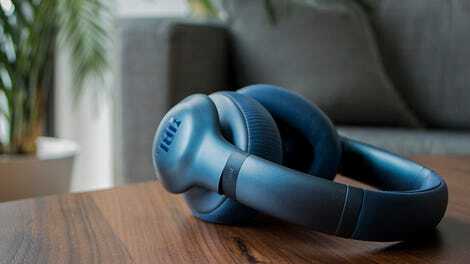 What the new JBL headphones offer that none of the Beats headsets have, however, is a more flexible noise cancellation feature. 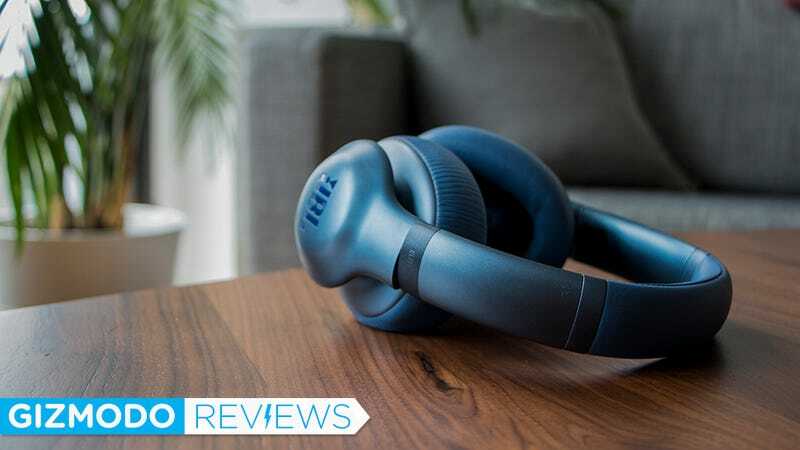 While both the Beats Studio Wireless and the 750NC offer adaptive noise cancelling (ANC), the JBL headphones actually offer, though an app, different modes for dealing with ambient sound. After you download the My JBL Headphones app for iOS or Android, you can adjust how much ambient noise the noise cancelling blocks out. The lower setting is great, if you’re walking through the city and want to hear traffic sounds, so you don’t get hit by a car. Cranking the noise cancelling to the max with the most extreme setting is perfect for a noisy coffee shop, when you want to block out everything and focus on your R&B soundtrack. The JBL Everest Elite 750NC versus the Beats Studio Wireless. Now let’s get down to business. On a normal day, the $300 JBL Everest Elite 750NC are a solid alternative for the $380 Beats Studio Wireless, particularly with that better noise cancelling. Whether you should buy the JBL headset instead of Beats right now is the real question. Last year, Apple released new versions of the Beats X and Powerbeats3 wireless earbuds as well as a new model of the Solo3. The three-year-old Studio Wireless have not changed in three years and are due for an update, but they’re also on sale at Best Buy right now for $200, while they’re normally available at Apple for $380. That’s honestly a great deal, but sales come and go, and the JBL headphones are brand new. If you like big bass and adjustable noise cancelling, the JBL Everest Elite 750NC is a great choice. They’re really nice headphones no matter how you measure them. Yes, the bass is (somewhat surprisingly) more extreme than most, and the audio fidelity isn’t quite as good as, say, a $500 set of Sennheisers. The noise cancelling is better than most headphones on the market, and the flexibility is nice. You can even get the JBLs in an iridescent blue color which, as you can see in my photos, is pretty bold. But even the black JBLs will make you look more unique than anyone in the Beats army. Big bass-heavy sounds but weak on mid- and high-range notes. Terrific noise cancelling with a handy way to adjust it through an app. Great battery life at 15 hours with noise cancelling turned on. Ultra light, very comfortable, and damn handsome. Only a good Beats alternative if Beats stay so expensive.